10-year-old Bryan Baker of Pontiac, Illinois was killed Wednesday after being struck by a pickup truck just outside of Pontiac. Pontiac is located in Livingston County where it is the county seat. According to reports, the collision occurred while Bryan was riding his bicycle with his family while riding northbound on Livingston County Road. Bryan was struck by a pickup truck travelling eastbound as he road across Illinois 116. Images of this intersection appear to show stop signs for traffic on Livingston County Road but no traffic control signals for traffic on Illinois 116. This collision remains under investigation with the Livingston County coroner and the Illinois State Police. Pontiac is the location of another recent motor vehicle vs. bicycle collision that involved an Illinois Secretary of State van and a bicyclist. As an Illinois Bicycle Attorney, I have unfortunately seen many collisions such as this. The liability in these cases is often unclear and require extensive investigation and analysis of both the law and the physical evidence. 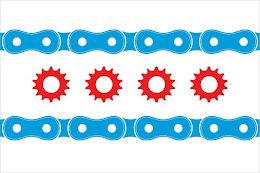 If you have any questions regarding this post or an issue involving Illinois personal injury law, please contact Illinois Bicycle Attorney Mike Keating at 312-208-7702 or MKeating@KeatingLegal.com. All initial consultations are confidential and free.